When creating Ice Bomb we wanted a strain full of flavor and a heavy coating of ice white crystals. It is a three-way hybrid of Vanilla Kush, White Rhino and our original Bomb #1, making it extremely potent and one of the most exciting new genetic crosses available. The finished buds are incredibly resinous and are covered in a thick bed of ice white crystals full of THC. When cured they have an intense flavor and smell that is an appealing blend of chocolate with hints of vanilla. 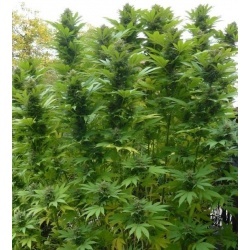 Ice Bomb is indica dominant, staying quite short but also extending outwards to form a fantastic bushy plant that will tend to produce a large single kola, whilst still producing heavy yielding side branches. During flowering, the buds and leaves can develop a purple sheen making it particularly attractive. Ice Bomb is very consistent and hardy and it will grow well even in difficult or less favorable conditions.